The Melbourne-based refugee and football player at the centre of an international tug of war has been moved to a detention centre in Thailand, despite being cleared to return home, a human rights group says. Hakeem Ali Mohamed Ali AlAraibi is a former member of Bahrain’s national soccer team, and also a critic of the country’s royal family. After allegedly being tortured by Bahrani authorities in 2012 and fleeing the country two years later, he was granted asylum in Australia last year. But on Tuesday, Mr AlAraibi was detained at Bangkok Airport at the request of Bahrain, which had issued an Interpol Red Notice for his extradition, the Bahrain Institute for Rights and Democracy (BIRD) said. 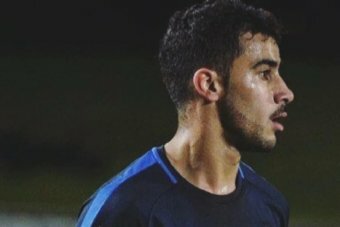 Mr AlAraibi was told by the Australian embassy on Friday that the matter was cleared up by Thai authorities and he should book a return ticket to Melbourne, the group said last night. “A few hours before his scheduled departure, AlAraibi was informed that he would not be flying to Australia and was taken to a detention centre in Bangkok instead,” the group said in a statement. The Bahrain Embassy in Thailand said via Twitter that “​​the suspect is wanted for security cases”. “If Hakeem is extradited to Bahrain, he is at great risk of facing torture and unlawful imprisonment,” BIRD’s director, Sayed Ahmed Alwadaei, said. “His extradition would constitute to refoulement and therefore would be a clear breach of international law. Rights groups said the issuing of a Red Notice for Mr AlAraibi violates the international police organisation’s policy that the notices will not be issued “if the status of refugee or asylum-seeking has been confirmed”. The notice says he is sought because he was sentenced in absentia in 2014 to 10 years in prison for allegedly vandalising a police station, a charge he has denied. He said he was playing a match that was televised live when the alleged crime occurred, but when his family members reached out to Bahrain’s soccer association to confirm his alibi, their requests went unanswered. A visa granted by the Australian Government was supposed to allow Mr AlAraibi to remain in Australia indefinitely and to travel to and from Australia without having to travel to Bahrain, the country he has sought protection from. “Hakeem is a refugee accepted by Australia, so Thailand should do the right thing by sending him back to Australia on the next flight,” Sunai Phasuk, a senior researcher with Human Rights Watch in Thailand, said last week. “Under no circumstances should Thai immigration authorities hand him over to Bahrain, where he faces 10 years in prison on a politically motivated conviction and a repeat of the torture he experienced before he fled. Mr AlAraibi has said he was blindfolded and had his legs beaten while he was held in Bahrain. SBS reported last week that Mr AlAraibi feared for his life if returned to Bahrain. “It’s very dangerous there [for me],” he said. “In Bahrain, they want to kill me. “I told [Thai Immigration] I [didn’t] come from Bahrain, I have an Australian travel document. Mr AlAraibi now plays for Melbourne’s Pascoe Vale Football Club. The club’s chairman, Lou Tona, last week told the ABC that Mr AlAraibi “was a respectful kid, a respectful person and respected within the team mates”. “He never got out of line, he’s just a quiet unassuming character. The Department of Foreign Affairs and Trade last week told the ABC that Australian embassy officials in Bangkok were in direct contact with Thai authorities about the issue.